Hello, glad to hear from you. I'm not sure how to decipher the number, but the hull ID # is MYN28024M78B. Any information that you have will be gladly accepted. Location: Central New Jersey, sailing on the Navesink River and Sandy Hook Bay mostly. MYN28058M78H I think mine was built in March (1978). Hull 1 is for sale in Tennessee. It does help, very kind of you to share. The previous owner of my Mariner made some modifications to the cabin interior. Most we're good, keeping a lot of the teak. He however, put vinyl flooring on the cabin ceiling and floor. While rather practical, not a look that I care for. I'm one of those guys, and my girl is one of those girls that prefer a more traditional look. Any chance that you have pictures of the interior of your Mariner? I would like to see the original lay out and get some ideas for the winter refit. lwi2858 (at) gmail. I may have a swatch of the vinyl, but I wouldn't advise trying to match it. You should check in at MYOG. There are a few folks who just got boats, and may be willing to take pictures. Also If you need lenses (most do) for the P & B stainless nav lights, I can get you a contact. My cabin had a teak and holley sole, and mahoghany panalling everywhere else. The windows had leaked and destroyed the mahoghany around the cabin trunk, and the sole had rotted;got the sole up and was planning on Lonseal for the replacement. My cabin was kind of dark due to the mahoghany, I was planning ultra suade for the cabin trunk around the windows. You can do all kinds of stuff with cork flooring, a light color with teak or mahoghany (depending on how they finished your cabin) battens could look nice, easy replacement and practicle, as its a noise insulation. "Traditional" is a funny thing. Teak was originally used because it was CHEAP. Real yachtsmen used cherry or walnut! The "herreschoff" look, with mostly white panels and dark trim is very practical, as it "lightens" the cabin, and looks nice. Look at a lot of boats, traditional gives you a lot of latitude! 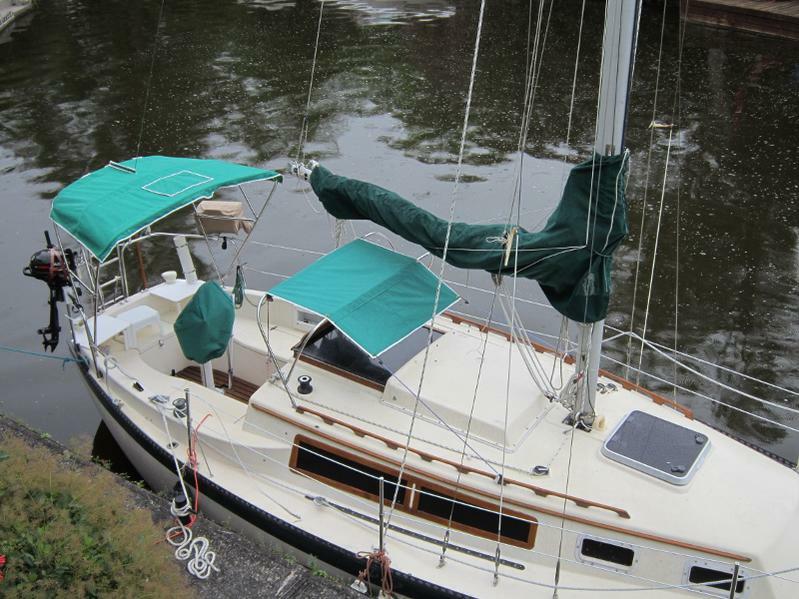 If you still own a Mariner 28 sailboat please contact me. I am trying to start a Facebook site but need other "members". My boat is a 1978 model which I have owned for a year. I am located in Ontario, Canada. I have been the owner of a 1978 Mariner 28 for about a year. I have lots of photos of the boat interior if you are still in need of ideas. I have made quite a few modifications to our boat. How can I contact you? I set up a Mariner FB page, you are welocme to be an administrator. I don't see any pointin multiple pages. My e mail is lwi2858 at gmail. Have you checked the Mariner's owners group? I have replied to you on Gmail. I wanted to drop in and say hi to the Mariner owners out there. I just picked up an old Mariner 28 and aside from a few dozen questions that I am figuring out the answers to, love the boat.